New Year celebrations in Thailand – 3x the fun! A part of the reason we wanted to live in Thailand instead of coming for a short holiday was so that we could get to experience the different aspects of Thai culture. Excitedly for us this has meant that we have been able to experience three different New Year celebrations, our usual 1st of January, then the beginning of the Chinese Lunar Calendar year in February and then Thai Songkran held over the 13-15 April. Being sick on the 31st of December Nic and I didn’t end up going out and joining in the festivities, instead we had a quiet night in our apartment. But I’m glad we did because just before midnight we were awoken by popping sounds, we looked out our window on the 21st floor and saw a wonderful sight – fireworks going off in every direction all across the city. It may not have been the grandest display we’ve seen but it was like nothing we had seen before. Wherever we looked there were burst of colour flashing in the sky, the popping of fireworks was like music intensifying the excitement with each explosion – I stood at our window and watched in wonder. Fireworks have always been something I find wonderful to watch and this display helped bring something special to an otherwise quiet New Years Eve. With a sunset view like this you can imagine what fireworks everywhere looked like. There is large Chinese community in Thailand so Chinese New Year is a big thing. We joined in the festivities in Bangkok’s Chinatown. The main Street (Yaowarat Road) and the surrounding streets were blocked off in anticipation of the crowds and the big New Year parade. We joined thousands of people dressed in red or traditional outfits celebrating the day. There were red and gold lanterns everywhere, dragons dancing down the street, lots of noise from drums (big ones and little ones attached to paper dragons) and lots of happy people. I found it fascinating watching all the goings on from people making offerings at the local temple to the dragons everywhere. Of all the New Year celebrations Songkran was definitely the biggest and most widespread. We decided to head out of town for the the 4 days of official holidays, heading to the small seaside town of Si Racha. 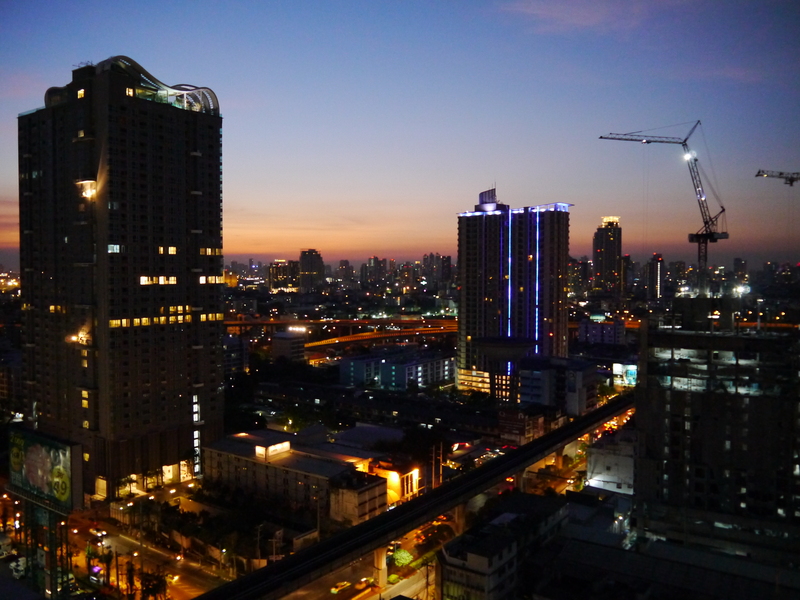 We’d heard about what Bangkok can be like during Songkran and we decided we wanted a slightly less crazy holiday. Songkran is a time of cleansing and renewal. Water is a big part of the celebration, used to cleanse Buddhas, used to bless elders and family members, and used in blessing others as well. This leads to a time where it isn’t uncommon to walk out your door and get drenched from head to toe. Areas of most towns are often blocked off and one big water fight ensues. We managed not to get too wet in Si Racha – it was easy to dodge the children with their water guns and buckets but not so easy to dodge the pick up trucks loaded with people and tanks filled with water. After a a couple of quiet days we decided it was time to seek out a bigger water fight and went to the beach side town of Bang Saen – we knew we were heading to the right place as the we got drenched sitting in the Songthaew on the way by people in the street or in passing pick-ups. I think we were a bit of a novelty in the town as their was only a couple of other foreigners in the area. This might not have been the case if we had come a couple of days later on the 16th or 17th when they had a big celebration planned. The Buddha outside our apartment. Getting ready to splash people! One of the many Watergun shops! The very soaked road down to Bang Saen Beach. It has been so much fun bringing in the new year in so many different ways – I look forward to seeing what the new year will be bring. Keep thiks going please, great job!